I just started playing and it's awesome. I've only been out on the course like 4 times but my friends and others I've gone with have beenimpressed. I had been out on the driving range alot before I went out on the course and even had a lesson or two since over the years I've been trying toget into it. Psyched I finally did. Shoes: Adidas 360 Tour Ltd. I play every other day around spring and summer when the weather is good. The game of golf is so frustrating,but at the same time its fun. OP I have similarclubs as yours(x18s),but they are a bit older. Very solid clubs for beginners. They are very forgiving. I just bought about $2000 worth of clubs/gear this year with my bonus. I know, all the Nike sounds hypebeast, but it was the easiest product I could get ahold of through my company. Hov, how do you like your Callaway driver? I tend to really hook the ball, and my Sumo doesn't help much for that. I have been thinking about ctaching aBoxing Day sale... just trying to fiure the best route to go? Hov, how do you like your Callaway driver? I tend to really hook the ball, and my Sumo doesn't help much for that. I have been thinking about ctaching a Boxing Day sale... just trying to fiure the best route to go? Honestly, the Driver has got to be the hardest club to hit. I slice it right like it's going out of style. I even bought the version of the Diablo thathas draw built into it. It's so frustrating because on the irons I'm like dead striaght. I hit the pin on one hole with my pitching wedge from about 35 yeards out lastweekend. My friends were freaking. I ended up hitting my 5 iron off the tee the majority of the day. Then I pulled out my driver on the last hole and had a decent shot. I really need to spenda weekend at the driving range. I remember making a thread with this exact title a few years ago on NT. I've been playing since I was about 7 or 8. Handicap is about 7 since I don't really have the time to play anymore. I actually work at a golf courseduring the summer so I'm able to play for free, but the bad part is that I didn't even go to the range once this year. Callaway makes great golf clubs, and they're perfect given your ability level. As you get better you will come to realize that Callaway clubs are designedwith forgiveness in mind, which makes it difficult to work the ball. However, this won't be a problem for you since the primary objective should be to hitit straight. I personally use mostly Titleist clubs, and I'll try to get a picture up before mid-terms. If you have any questions, don't hesitate toask. Started playing a few times this year, I really enjoy it despite sucking at it. I took a class over summer, instructor helped out but I just didn't makethat much of a breakthrough. I still want to keep with it, but I need bigger clubs, which I can't really afford right now, plus it gets expensive topractice and play. Hopefully when my finances are in better order I can get back out there. Honestly, the Driver has got to be the hardest club to hit. I slice it right like it's going out of style. I even bought the version of the Diablo that has draw built into it. It's so frustrating because on the irons I'm like dead striaght. I hit the pin on one hole with my pitching wedge from about 35 yeards out last weekend. My friends were freaking. I ended up hitting my 5 iron off the tee the majority of the day. Then I pulled out my driver on the last hole and had a decent shot. I really need to spend a weekend at the driving range. That is really the only way I can hit consistent drives, if I am able to hit 50-100 balls before a round. I have acompletely different swing when I drive, too... I know everyones different from their iron shorts... but I have had to completelllly retool my swingusing a driver. I don't know if this is good or bad, but it does seem to allow me a more consistent drive. I personally use mostly Titleist clubs, and I'll try to get a picture up before mid-terms. If you have any questions, don't hesitate to ask. How are Titleist's irons (an average set)? Clevelands, if you have used them? Alot of my friend swear by Cleveland... but these are the samefriends that bring a case of beer in their bags on any given round. Me and my brother hit the golf range every now and then. I should have hit up a course during the summer. 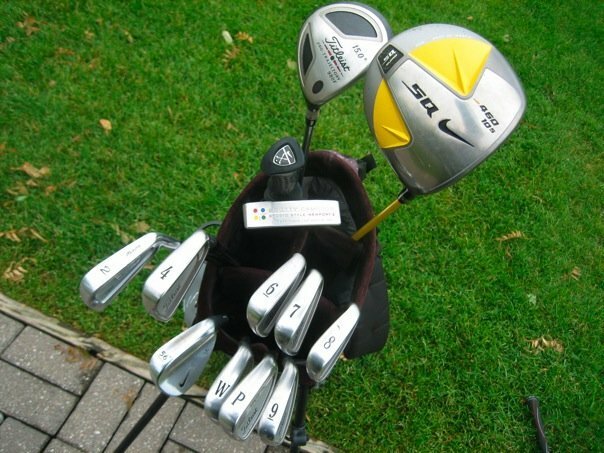 I have a mixed bag of clubs, I play about bogey golf. My best 18 hole score is +14, shot +17 a few weekends ago down in Coronado. I play the little executive course by my house once a week, best I've done there is +5 over 9 holes. I used to play generic Wilsons, but slowly started picking up random clubs when I found a Callaway X-18 4 iron for $5 in a used bin at a club shop. 60 Degree Wedge: Cleveland CG 10 1 Dot (low bounce, my go-to club for chipping/pitching around the green). Got my first chip in birdie the first round I playedthis club, and have holed 5-6 more on the practice chipping green, super versatile club). Too many people worry about trying to hit their driver well, but honestly, you should focus the most on your putting and your short game. if you can find aclub that you hit well for average distance, and you have a solid iron/short game, you will outplay anyone that has huge drives but can't stick the ball onthe green or can't putt worth !!#+. Hitting the driver is a huge ego thing, and it feels great when you hit it long, but it's pointless when you can't control it. If I'm playingserious, I only bring it out when I'm playing a hole that plays to my slice, otherwise I just tee off with the Tight Lies (usually good for 200-230 yardsstraight down the middle). I might only get 20 more yards out of my driver, and it's never straight down the middle. Don't waste your time going to the driving range trying to learn how to hit your driver well, go invest in some wedges and practice your short game. Iguarantee you will see much more improvement in your scoring than hitting your driver a little longer and straighter. How do you like the 980? I hit a 13 degree the other day but I didn't pull the trigger. How much distance do you get out of it? I love golfing. I'm what they call a club-ho. I love tinkering with new equipment so I trade often. Here's my current bag. Gonna be keeping up with this thread. Been to the driving range (not in a while lately though) and might go to the course for the first time this weekend.Someone just invited me, but I've never played on a course before and haven't decided whether to go or not. I have acompletely different swing when I drive, too... I know everyones different from their iron shorts... but I have had to completelllly retool my swing using a driver. How are Titleist's irons (an average set)? Clevelands, if you have used them? Alot of my friend swear by Cleveland... but these are the same friends that bring a case of beer in their bags on any given round. Titleist makes great clubs, but keep in mind that they are designed for serious golfers. This means that they aren't the easiest clubs to hit,although they have started to make some more forgiving clubs as of late. If you're looking at Titleist irons, definitely go for a cavity back set. Oneother point about Titleist is that their golf clubs have a very traditional look. This is a big thing for me because you have to like what you're lookingat if you want to have the confidence to hit a good shot. Titleist clubs fit this description for me because they aren't offset and don't have an oddshape about them. As for Cleveland, I haven't personally hit their irons but I do have three Cleveland wedges in the bag. The Cleveland wedge is their bread and butterproduct, and pretty much set the standard for wedges on tour. Used to play a lot when i was in middle school. I haven't been out on the course in years tho. nice scotty's up there. If you don't feel like dropping 275+ for a scotty, taylor made rossa's are the best bang for the buck. Very solid putters.